Golden orange-colored brew that pours with a moderate head. Notes of citrus fruits, oak, and sour apple on the nose. The taste is dry, yeasty, earthy, and fruity, with lemon and orange notes. This beer is tart, but not overly so. Very refreshing, it has a mild bitterness in the finish. 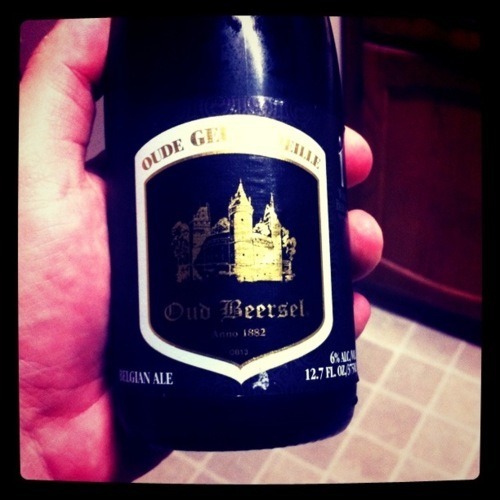 I love a good lambic, and anytime that a beer bottle is corked, I start to get excited! This beer, well… I have no idea how to pronounce the name of this. It’s a Belgian beer, so you know it’s going to be good. But I am lucky to pronounce the brewery, let alone the beer’s name. It smells incredible. Actually, from the moment I popped the cork it had a clean, citrus nose to it. Imagine squeezing a ton of lemons and some orange zest into a bottle of sparkling water. Did you know that in Poland (and other foreign countries) they prefer their water carbonated? There is a LOT of carbonation on the front of the palate, and then you are hit with the fruitiness overtones. It drinks quick, and there is a weak aftertaste, but it’s LOADED with tart. Holy crap, I can barely drink this without squinting. There is a ton of tart… almost like slamming back a handful of Sweet Tarts candy. How tart is that? Man, I can’t get over how tart this beer is. How is this even considered to be beer? It has hardly any typical beer qualities to it. I do like the fact that the brewery only sells this stuff on Saturday. Not sure what day we bought it, but apparently that doesn’t transfer over to the States! The beer is good… but not one that I think I could learn to love. It’s refreshing, but there is way too much tart for a beer with such a low ABV. Coming in at only 6% I expect a much more memorable flavor. But you remember that citrus that I smelled at the very beginning? Well it’s still here. That citrus flavor doesn’t go away. Drink this one slow, and enjoy it. You won’t want to rush this bottle. I’m not sure what to think of this next beer. It looks kind of like a wheat when poured into the glass, kind of a golden color, and slightly thick. It had a lot of head that was kind of bubbly and kept bubbling after being poured. Once the head dissipated, I took a whiff. Not a whole lot of smell, but what I could smell was somewhat fruity. The first drink also tasted kind of fruity, as well as carbonated. This beer isn’t bad, but what I don’t like is the aftertaste. The first taste of the beer is pretty good – tastes kind of peachy, citrusy, and carbonated… but I don’t like the aftertaste at all. And it doesn’t stick around too strong for very long, but it’s it the second thing you taste when taking a drink of the beer. If it wasn’t for that second aftertaste, I would like it better, because I like the first taste I get when drinking it. It’s like it gets more tart as it goes down. Not horrible, but I don’t think I’d buy it again.